Our #1 purpose in chiropractic is to provide care that supports and maintains your health. We’ve always considered health to be more than just being out of pain. It’s enjoying a better quality of Life and maintaining a balance between your physical, emotional and spiritual well being - and we’re not the only ones who believe so. The World Health Organization (WHO) defines health as, “a state of complete physical, mental and social well being and not merely the absence of disease or infirmity." Your health is more important to us... 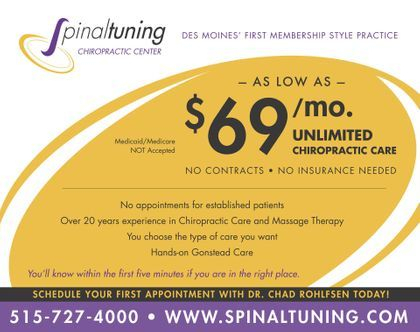 Regardless of what Medicare believes, our duty is to provide the finest Chiropractic maintenance/wellness care to promote your health and quality of life. Please don’t let Medicare’s policy discourage you from receiving the care you need. If you’re on a fixed income, we have options to fit your budget. We’re happy to help you any way we can. All medicare recipients will be required to sign an Advanced Beneficiary Notice before receiving care in this office.